In these research pages we have attempted to write them for the intelligent layperson as Quantum Technology will eventually make its way out of the laboratory into your hands. Extra details, and links to journal papers and websites, can be found hovering the mouse over, or clicking, highlighted text. We will add more details when possible. The gas particles in the air surrounding us are whizzing about at velocities near the speed of sound and colliding with their surroundings and with each other thousands of times per second. This is a very messy system for physicists to try and understand the internal workings of the particles, so we would much rather the particles sit still while we prod them. Ultracold atoms are our solution to this problem by slowing the atoms (and thus cooling) them to a near-standstill using laser cooling and magnetic trapping (see MOT page for how this works). These atoms, or ions, are cooled to millionths of a degree above absolute zero temperature (-273.16C or 0K), and even lower. This all occurs in an ultra high vacuum chamber so that the atoms are not affected by collisions with other particles, and this produces argueabley the purest quantum systems available. The best example of this is the production of 'degenerate quantum gases', most notably Bose-Einstein Condensates, in which one can see (with your own eyes) the Heisenburg Uncertainty Principle at work. 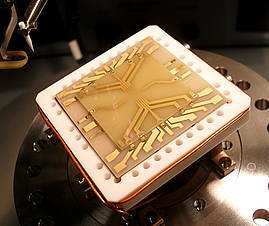 The extraordinary properties of the quantum mechanical wavefunction allow a variety of quantum-enabled measurement and processing techniques with the potential to surpass the precision, sensitivity and compactness of conventional, classical systems. Using the wave-like nature of carefully controlled beams of atoms or ions in place of optical waves, atomic interferometers bring the precision of the short de Broglie wavelength, and a sensitivity to mass and charge, that allow the precision of laser gyroscopes to be beaten and extended: quantum coherence is exploited to yield tiny but precise accelerometers, gravimeters, gyroscopes and magnetometers with a wealth of applications from navigation to geodesy and prospecting, and from seismology to medical imaging. The small size, sharp resonances and indistinguishability of atoms of a given element allow tiny atomic clocks with absolute accuracy, for applications from time-keeping to communication frequency standards to global position-finding. The fundamentally quantum process of entanglement allows intrinsically secure communication, massively parallel processing and resolution-beating quantum imaging, while squeezing can be used to extract the ultimate sensitivity. The heart of many such quantum-enabled techniques is a sample of ultracold, vapour-phase atoms or ions, whose thermal motion has been slowed until the atoms are all but stationary and can be caught and manipulated by gentle optical or electromagnetic potentials. Many researchers world-wide are investigating the miniaturization of such systems into 'atom chips', which allow the trapping and manipulation fields for ever more complex processes to be produced by the electrodes and conductors of a tiny microfabricated circuit. Atom chip configurations have been and continue to be explored for magnetometers, gravitational and inertial sensors, and atomic clocks; and laboratory demonstrations have shown world-beating performance with, for example, chip-scale magnetometers recently demonstrating (tens of fT/Hz½) sensitivity that can otherwise only be obtained using cryogenic SQUID sensors. The development of laboratory prototypes into true technological devices will require miniaturization not just of the manipulation fields and electrodes but also of the cold atom sources, vacuum chambers, pumps, gauges, lasers, optics and detectors that surround them. This is where we come in.